While I have dabbled in all kinds of photography, Landscapes have always been my passion. That is because I love the all things outdoors, including hiking. Not too long ago, I heard an interview with Nathan St. Andre discussing hiking and photography tips. I was immediately intrigued. Especially because Nathan is from Southern Utah, just outside of Zion National Park, which is not too far from me. After listening to his interview, I decided to look Nathan up on Instagram (@southern_utah_hiking) and his website. 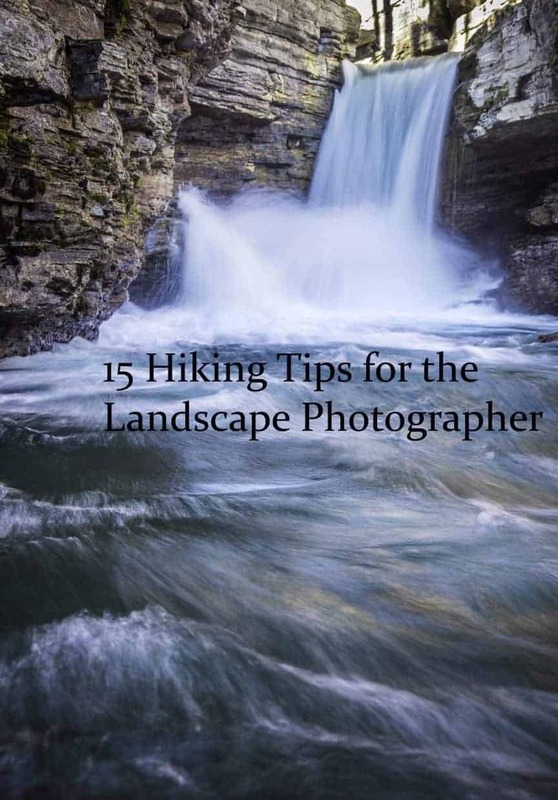 I commented on one of his posts and we started talking and within a couple days we had agreed to collaborate on an article specific to hiking for landscape photography. The Great Undercut by Nathan St. Andre. I am pretty sure I am going to be soliciting Nathan as a guide to take me here as soon as possible! As with any of tips-style articles, I am sure we missed more tips than we included. And, we probably included plenty that is not applicable wherever you are living, but hopefully you can find something useful. If you have additional tips, please share them in the comments. Most important of all, just get out there and go hiking. Even if conditions aren't perfect and you don't have all the gear you want, you can still have a great time hiking and have it lead to some amazing images. 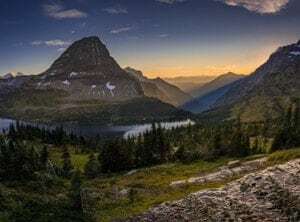 This image is from Hidden Lake taken during the IP outing at Glacier National Park. The hike up to this point took about twice as long as I was expecting so it was good we left plenty early to catch the good light. One of the first lessons you learn shooting landscapes is shooting during the golden hour. While it is possible to make good images at other times, the best bet for good landscapes is shooting at sunrise or sunset. When hiking is involved, Nathan recommends planning a sunset shoot. Hiking is a lot easier in the light so if you need to find a location, you do not want to be stuck in the dark. It is easier to find your way back to the camp or car along a familiar trail, and the light will also linger for a while after the sunset . It is also easier to set up a composition and plan your shot before sunset. This isn't to say you cannot get a successful sunrise shot that involves hiking, it would just take more planning and hopefully scouting the area before. After making plenty of images at Kanarra Creek Falls, I was able to make some images on the way back without the stress of getting to the waterfall on time. While most hikes lead to a destination and you should plan to be at that destination for the best light, a lot of great images can be made during the hike as well. Whenever I hike, I try to have my camera out while I hike. Depending on the hike, I may carry my camera in my hand, wear it like a sling or use my Peak Design Capture Clip. Nathan recommends planning to shoot images on your hike back. Obviously, this will not work well if you are shooting the sunset, but there are some key advantages to shooting on your way back. First, you will hopefully have already nailed your main shot and can relax and feel free to shoot whatever you see. Second, you will have had a chance to plan images you saw on the way up and you will be getting a second look for things you missed. If you are shooting the sunset, it is a good idea to leave plenty early so you can make images on your way up without stressing about making it to the destination. 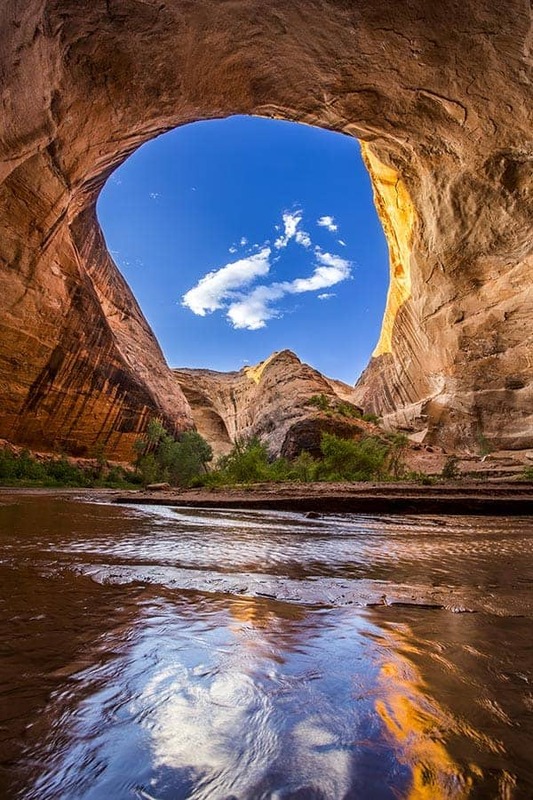 Being from Southern Utah, Nathan is experienced shooting deep canyons. 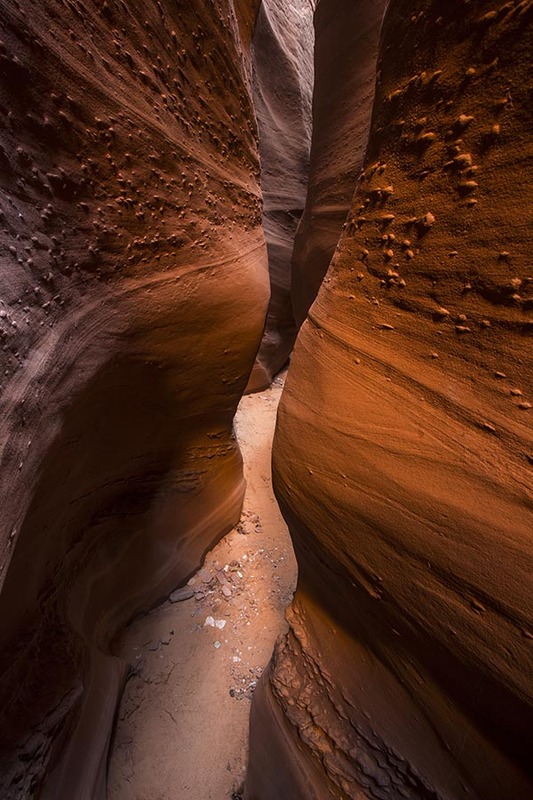 With slot canyons, the key is getting directional light dropping into the canyon. 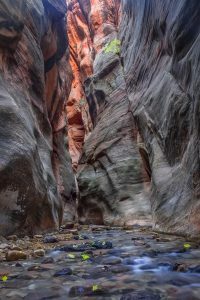 The bands of light hitting the canyon walls create the beautiful glow you see in the best images of slot canyons. You can usually find the best light in late morning, but there is no set rule, and the best time is going to depend on how deep the canyon is, how wide the opening is and the angle of the sun. Spooky Gulch by Nathan St. Andre. As you can see, slot canyon's are Nathan's specialty. This image has that beautiful red glow and great definition that comes out with good directional light. With how narrow this canyon is, I am guessing it was well after sunrise or before sunset. HIKING BLOGS ARE A GREAT PLACE TO START YOUR PLANNING. It is easy to find great photo locations on the web, but most sites will not give you good information for the hikes that get you there. Nathan recommends starting with hiking blogs. 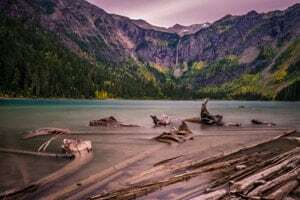 These blogs can be a great resource as they usually provide much better details on the hike and will highlight many different locations within one hike. 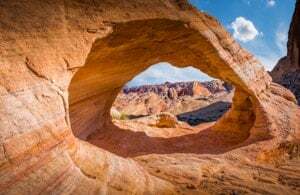 Nathan operates his own hiking blog that is great for people in Southern Utah, but you should be able to find something helpful no matter where you are hiking. I hiked Wallace Falls in Washington with my older brother a couple years back. 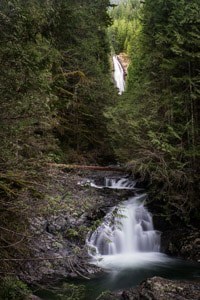 This hike is loaded with photo locations as it boasts three impressive falls. This image shows the lower and middle falls. Remember, not all hikers are photographers. The world is full of hikes that lack interest for a photographer. Hiking blogs often focus on forks in the trail and landmarks rather than great photography locations. If you see a hike on three or four blogs and do a google image search and do not see any great images, it is probably not worth your time. Never limit your search to a single blog or website for any given hike. Nathan says any one site never tells the full story. He recommends also using 500px, Google Earth and Instagram. For National Parks, Nathan recommends searching the park in general in addition to hiking trails as some of the most spectacular locations may be intentionally left off trail maps to preserve those locations. The last thing you want is to hike three miles to a location only to miss the good light because the hike took longer than you thought. While you can never know exactly how the conditions of a hike will impact your time, knowing your speed will be a good starting point. Nathan recommends you measure out a mile in your neighborhood, trying to include a decent amount of ups and downs. Then load yourself up with a decent backpack and time yourself walking that mile. That will give you a good starting point from which you can factor in fatigue from each additional mile and conditions that appear more difficult than your neighborhood walk. Thunderstorm Arch in Valley of Fire, Nevada. I had a gallon of water with me on this hike and went through it all when I got lost for three hours trying to find a location that still eludes me after three tries! Nathan's biggest tip here is to be smart. People die all the time from hiking in the heat without water. While he says he only needs a half liter in the winter, he starts with two liters in the summer and adds if the temperature is especially high or the hike is long. If there is water accessible on the hike, filtering is a great option to ensure you can stay hydrated and keep your weight low. I have been using Seychelle water filtration bottles for almost 20 years all over the world. They work great and keep my bag light (you can get yourself one at a discount from my distributor via email at [email protected]). Nathan recommends getting synthetic fabrics and avoiding cottons. Layers are the best way to go when dealing with colder weather. Make sure your clothes are breathable and you can shed layers to avoid soaking in your sweat after a good hike. I spent a trip hiking Zion with a t-shirt and ski jacket and it was pretty awful. Take a listen to tripod episode 35 for some great tips on how to layer. Good shoes are essential to enjoying a hike. Nathan uses trail running shoes for most everything, but occasionally wears larger hiking boot as conditions dictate. He warns against using something like a converse or skater shoe. You want to make sure your shoes offer some support. Traction is also really important, especially with the cliffs and loose sand in the Southwest. 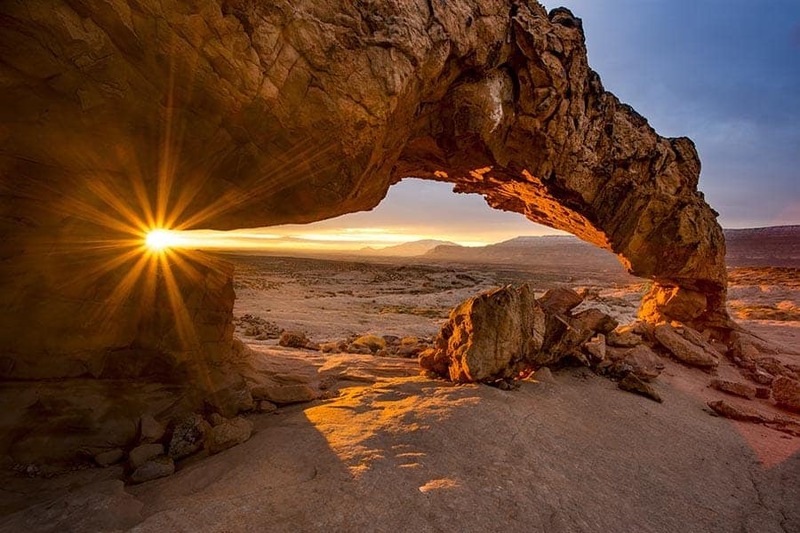 Sunset Arch by Nathan St. Andre. You want good shoes to be scrambling over these rocks that likely had lots of loose dirt around. Nathan had a lot of the same views I have for a backpack. Nathan's two essentials are a waist strap and extra space. For any sizable hike, you are going to want to carry water, food and some extras that you can pack into extra space that is not dedicated to camera gear. Nathan uses Click Elite bags, which I have heard great things about, but have never tried. My favorite bag for hiking is from Tamrac, but I also love the quality put out by Think Tank and Mindshift and Jim Harmer swears by his Mindshift Gear Rotation 180. Be sure to check out my review of most of the bags I use, including my Tamrac bag and bags from Think Tank and Mindshift Gear. You do not want to load your bag down when you are going to be hiking all day. Keep to the essentials. Nathan recommends your camera, tripod, polarizer filter, knife, rope, snacks, head lamp, and water. I would second everything on that list and add neutral density filters, an L bracket and a small towel (for sweat or drying your feet after going in water). Avalanche Lake in Glacier National Park. About halfway through this hike, I was wishing I had some bear spray, but enjoying this amazing location by myself for an hour was pretty incredible. Nathan suggests bringing a knife in case of emergency. In most of the U.S., people don't have to worry too much about what animals they will meet, but be aware of the threats where you are hiking at so you can prepare accordingly. I could repeat the advice about water and food here in case you get lost. GPS is always a good idea as well. If you are in bear country, people recommend wearing bells and carrying bear spray. Pepper spray might be a good idea if you are wary of smaller predators. I know from experience that hiking alone in bear country, especially in the dark, can be a scary thing. Unless the hike has a well-established destination, it can be tough to determine what photography opportunities you will find. If you are not sure about a hike, Nathan recommends taking your family during the daytime. That way you can enjoy a family hike without the pressure of finding a good image. If you find something worthwhile, you can scout compositions and determine the best light for the scene and return for that light. 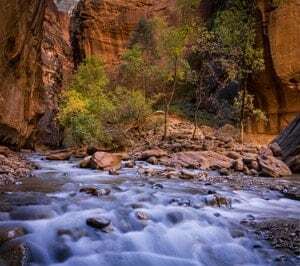 I didn't have my kids with me here and the hike up the Narrows would have been tough with them, but they would have loved playing on the rocks while I made this image. This is a tough one and Nathan claims to be terrible at it. He suggests keeping a child strapped to your back if you can or explain that you are working. I have a three-year old and two-year old and have had some success recently. I have found my kids can be entertained for a long time if there is water nearby. You have to be careful to keep a close eye on your kids while you are doing photography, but my kids love throwing rocks into the water. Creeks are my favorite because they are usually shallow enough for the kids to play in. If there is no water around, my kids like to pick up sticks, collect flowers or leaves and play in the sand/dirt. Snacks are also a great way to keep kids entertained. If my wife is with me, we will pack dinner and she will eat with the kids while I focus on photography. 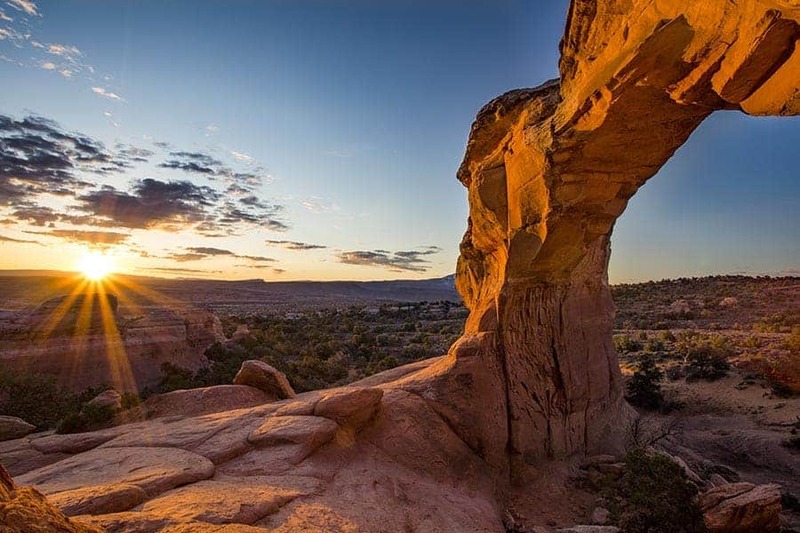 Broken Arch by Nathan St. Andre.